ok... now just for gimil's approval of the idea, and luxembourg away! to move to main foundry - its hardly been in here! and also its not even been classed as an advanced idea yet! unless you can skip that part??? Can you just stop spamming this thread please? I haven't got any real feedback since RJ's post a page and a half ago! Tom I appreciate your interest but if you don't have anything useful to post just refrain from doing it please. Thanks. ok so the map... like people have said before, the mini bonus map needs some work. it does look quite simple, and the colours are a bit off the real map. also, how many neutrals start out on luxembourg city? I think I agree with Tom on making the texture/colors on the minimap match the real one. As for neutrals on Luxembourg City, I think it should start with 3. Nothing fancy, but they make sure no one gets that bonus on the drop. ZeakCytho wrote: I think I agree with Tom on making the texture/colors on the minimap match the real one. I am undecided between 2 or 3 neutrals for Luxembourg City. What do others think about this? It's a small map and 3 might be a bit too much when you consider the units you might lose to conquer it, but I'm not sure about this reasoning. The Viking wrote: I say 3. Okay I'll male a poll. i think that its a small map so 3 is quite a lot to put on there, i think there should be about 2.4 amies on there - but you cant do that so i think 2. Okay thanks for your input Tom. That's how I want you! I like the latest version a lot, and due to the smallness of it, you won't need impassables. Showing the country's borders with other nations is a nice touch, too. One question: what's with the "NB"? I have no idea what this means and don't consider it necessary to convey that Luxembourg City starts neutral. N.B. stands for nota bene, or, note well. It basically means to take note of whatever follows. I don't like how the Schultrange label cross over the borders. It's not very readable. It seems weird that Luxembourg City has a blue border at the north when the rest of the border is different. I think the continent colours would be better served being more like the mini-map. 1. I'd prefer the southeast continent to be a bit darker than you have it on the mini-map. 2. I think Luxembourg City would look better being more white. What else can i say on first sight....Bravissimo. Is it possible to gain some more clarity on the crest..it looks slightly blury? Also are you planning on naming the continents in the mini-map, only asking because edbeard picked me up on that one. Also, you have the neihgbours' flags in there, would it hurt to add the flag for Luxembourg? More of an educational thing i guess. 1-I love the map! It looks awesome. 2- I dont love the minimap, it looks like it came out of a Science textbook IMO. 3- Are there going to be continent names on the map? 4- Although easy to tell on the mini map, Luxembourg City seems to blend into the other continent. Kaplowitz wrote: 4- Although easy to tell on the mini map, Luxembourg City seems to blend into the other continent. at the top of lux city, the blue boarder, is that a river immpassable or what? if its a secret you shouldnt have told everyone! are you going to change the mini-map? I created a new version of the mini map. Maybe people like this better but I really don't want to focus on the mini map any more since I believe it does the job. No there will not be any region names on the map or mini map because they are not needed. 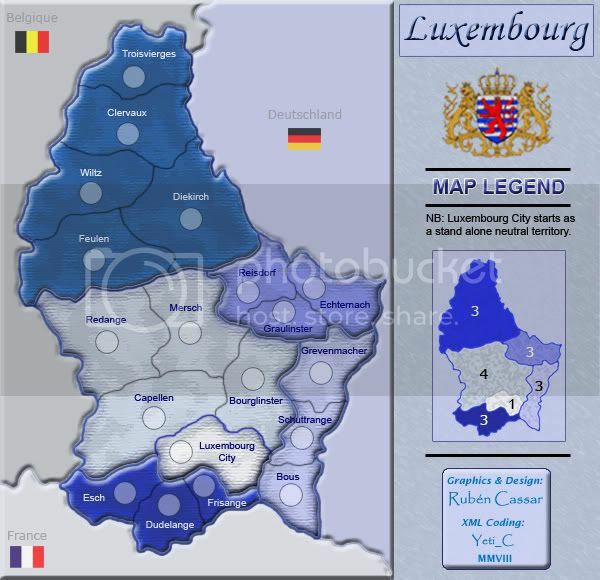 The blue border for Luxembourg City is there to denote that it is the capital city. Luxembourg City is actually part of that region in real life but I made it white and with a blue border because in the game it starts as a neutral and standalone territory. Ruben Cassar wrote: The blue border for Luxembourg City is there to denote that it is the capital city. but you cant see it on other sides and some people might mistake it for an impasssable maybe?